What properties in North Dakota are listed in the National Register of Historic Places? The North Dakota State Historic Preservation Office does maintain an online, searchable database of listed properties since the National Park Service maintains the National Register of Historic Places database. The official database is typically about one year behind in posting the nominations and can be accessed through the National Archives site: catalog.archives.gov/id/71974167. For more information on properties listed in the National Register of Historic places you can call the National Register Coordinator at 701.328.3576. Please have the property's street address or legal address (Township, Range, and Section) at hand. The Burke County World War Memorial Hall in Flaxton is a World War I memorial and community building built in a restrained Art Deco style. This two-story brick building retains clean lines with concrete vertical embellishment restricted to the full-height pilasters. It was designed by C.A. Pear of Minot and built by William Nordman of Noonan with the dedication occurring in 1931. The $25,000 needed to construct the building was raised through a county mill levy and from private donations. 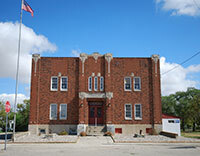 Flaxton Memorial Hall (as it is known locally) is one of only seven World War I memorial buildings in the state that was built to house government offices, community groups, and events that is still used that way today. The Remote Sprint Launch Site 3 (RSL-3) in Cavalier County is a Cold War Spartan missile launch site that is the best preserved unit remaining of the Stanley R. Mickelsen Safeguard Complex, (SRMSC), the only Anti-Ballistic Missile site actually completed. It is not operational as an active military site, rather it is a public local attraction with an admission fee. It contains three major components–the Sprint launch pad with 16 empty missile silos embedded in the ground, the Limited Area Sentry Station (LASS) where one enters the site, and the large bunker Remote Launch Operations Building (RLOB), where service people maintained communications and equipment in ready for any potential launch situation while in contact with the other Stanley R. Mickelsen Safeguard Complex units throughout northeast North Dakota. This remote Sprint launch site was completed in 1973. The SRMSC was defunded by US Congress in October 1975. The Assyrian Muslim Cemetery near Ross in northwest Mountrail County is the site of the first mosque built as a mosque in the nation (not a repurposed building). It was the only Muslim cemetery in North Dakota for 90 years. The settlers in this local area began arriving in 1902 and came with the same dreams for living better lives that most homesteaders shared. They emigrated from mountain valleys in what is now Syria and Lebanon. This cemetery is significant as it is the only place remaining in the area that distinctly testifies to the culture of the Assyrian settlers and their decedents. 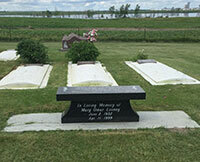 There are 41 gravesites, many with granite or marble headstones. Many also have wolf stones, slightly domed concrete markers that overlay the gravesite and protect it from animals and harsh weather conditions. There are also eight memorial markers in the cemetery.